Forgetting to turn off my phone’s Wi-Fi radio when out and about is a pet peeve of mine and I’m always on the lookout for ways to automate that action. These days, a Wi-Fi radio left on all the time won’t cause a major battery drain. Still, I’m dead set against wasting any juice because once a phone battery is dead, you’re left with an expensive, useless brick. 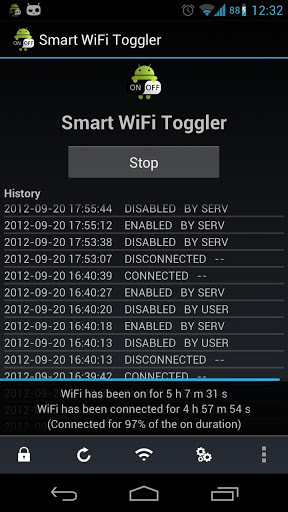 So when I saw mention of the Smart WiFi Toggler app on Lifehacker, I had to check it out. The free Android(s goog) software, found in Google Play, solves this problem in a way that doesn’t require yet another radio to be sucking down power; namely, it doesn’t use GPS. Instead, as explained by the developer, the software learns where your preferred networks are based on cellular triangulation. When it senses that you’re in range of a preferred network, the app toggles on your Wi-Fi. Likewise, as you leave the range of that network, Smart WiFi Toggler disables your Wi-Fi radio. GPS is ideal for precise locations, of course, but for this type of utility, using the cellular network for location is good enough. And there are certainly other ways to accomplish this task: I demonstrated one earlier this week in a video showing an NFC solution in my home. Other automation-style apps — Tasker and Locale come to mind — can do this and much more. What I like about Smart WiFi Toggler is that it’s easy to use, free and works well. I’ve been using MyProfiles (https://play.google.com/store/apps/details?id=com.fancy01.myprofiles.lite&hl=en) but will check out Llama and see if it is any more efficient battery-wise (wakelocks, etc). I wonder how much battery life this really saves? Has anyone quantified the actual benefit. Since WiFi is usually free I also wonder whether this would have an adverse affect on mobile data usage and even drive folks over their caps by missing out on new WiFi hotspots. Frankly I see little upside and potential for increased mobile data usage. The trend should be to move more data towards WiFi not away from it. Totally downloading this immediately! I, unfortunately, wasn’t grandfathered into the unlimited data plan so it is going to vital in lowering my total data usage. Thanks! how would this work on tablets without a mobile connection? I just installed this because it turns WiFi On when I get home and it seems to work, thanks for the recommendation. Unlock With WiFi is another good application for turning WiFi off when you go out. UWW also has an option to turn bluetooth on when it turns WiFi off so if you use your phone in the car with bluetooth, this is an excellent solution for not having to do any fooling around with settings when you get into your car. This could be useful for a future where we’d all be using VOIP calls through WI-FI, completely bypassing carriers, and being independent of carriers (unless the carriers own the wi-fi networks, too). Right now, it would be pretty hard to do that, while still staying connected all the time, so people can call you, but technologies like these that can somehow automatically connect you to the Wi-Fi around you, may help push for that future to become a reality eventually. I installed it yesterday (saw on another blog) and can say it works great! Just download Tasker, you can do much more! Armando, I mentioned Tasker in the article; it’s certainly an option that does much more. But, it’s not free and there’s a definite learning curve that not everyone wants to deal with. I’ll have to check that out! It could possibly make the list as a good app to use to decrease the use of clients data use.